A man used his false leg to try to smash an overturned lorry's window to rescue the driver during Storm Doris. Craig Nairn tried to break the windscreen with his prosthetic limb after the lorry was blown over in high winds at Ruskington, near Sleaford. Eventually the glass broke with the help of his friend, Lincolnshire's Deputy Police and Crime Commissioner Stuart Tweedale, who used a hammer. 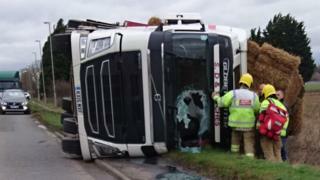 Mr Tweedale said the driver was dragged out shaken but unhurt from the cab. "I decided that I was going to make use of my prosthetic leg and try smash a bit of the glass out... So it did come in handy. Damaged it a little bit but it helped to save a man's life," said Mr Nairn. "My leg can be repaired or replaced but the man's life is well and alive." The pair were travelling independently of each other on the B1188 on Thursday afternoon when they both came across the lorry, which was on its side and had shed its load of straw bales with diesel fuel leaking out from the vehicle. Despite their best efforts neither of the two could get the driver out and in a last-ditch attempt Mr Nairn, who lost his leg in a road accident 10 years ago, tried to use his prosthetic limb before the pair turned to a hammer. "I was just doing what any normal person would do," said Mr Tweedale. "You just never know what's going to happen and I thought that diesel and straw was certainly not a good combination so it was best to get the poor driver out as soon as possible. "Thankfully I don't think he was injured but a little shaken by the experience."